RBG: A Reading List highlights texts written about Justice Ginsburg and by Justice Ginsburg. Additionally, this Reading List provides users with information and video on the nomination and confirmation of Justice Ginsburg, some of her more well-known authored opinions and dissents, and a few of the cases she argued before the Supreme Court. Download a printer-friendly version of the reading list here. 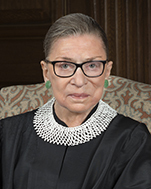 This February U.S. Supreme Court Justice Ruth Bader Ginsburg will visit the Washington and Lee University School of Law and will give a seated interview, open to the public, in VMI’s Cameron Hall Feb. 1, 2017 at 11:15 a.m. Appointed by President Bill Clinton in 1993, Ginsburg became only the second female justice, after Sandra Day O’Connor, in the history of the Supreme Court. Along with Sonia Sotomayor and Elena Kagan, she is now one of three women serving on the nation’s highest court. More information on her visit to Lexington will be available at a later date.